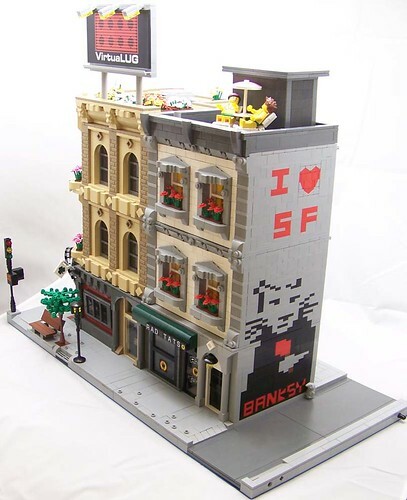 Brick Town Talk: Exit Through the Tat Shop - LEGO Town, Architecture, Building Tips, Inspiration Ideas, and more! San Francisco, California - (BTT) Real estate values have just gone up in a city where they are plenty high already thanks to a certain British artist who has left his signature mark on the side of a building that does the same to human flesh. Graffiti aside, there is a lot to love about this pair of buildings - it's worth taking a closer look at the sports bar on the corner to appreciate some of the clever detailing there. Residents of the apartments above can even enjoy a bit of sun on their roof terraces, assuming they can find a break in the fog.